Analytical Sensors plays a crucial role in today’s highly demanding exploration and development of new detection strategies. Whether it be medicine, biochemistry, bioengineering, or analytical chemistry the goals are essentially the same: 1) improve selectivity & sensitivity, 2) maximize throughput, 3) and reduce the instrumental footprint. In order to address these key challenges, the analytical community has borrowed technologies and design philosophies which has been used by the semiconductor industry over the past 20 years. By doing so, key technological advances have been made which include the miniaturization of sensors and signal processing components which allows for the efficient detection of nanoscale object. One can imagine that by decreasing the dimensions of a sensor to a scale similar to that of a nanoscale object, the ultimate in sensitivity can potentially be achieved - the detection of single molecules. 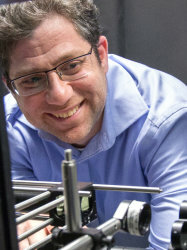 Prof. Joshua Edel received his PhD on the development of single molecule detection within microfluidic systems at Imperial College London in 2003. He then performed postdoctoral research in nanobiotechnology at Cornell University within the School of Applied and Engineering Physics. In 2005 he was awarded a research fellowship in single molecule biophysics at the Rowland Institute at Harvard University. In July 2006 he joined Imperial College London within the Department of Chemistry and Institute of Biomedical Engineering as a lecturer. Joshua is currently a Professor in the Department of Chemistry and in 2011 he was awarded a prestigious ERC Starting Grant on “Nanoporous Membranes for High Throughput Rare Event Bioanalysis” and in 2016 he was awarded an ERC Consolidator Grant related to the development of selective single molecule biosensors.